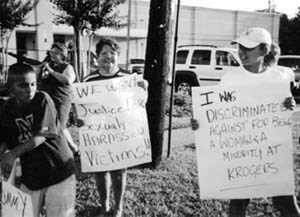 Leticia Mireles (on right) and supporters picket Krogers food store in Houston August 18 as part of a fight against sexual harassment on the job. Mireles said that she was "told to shut up about it," after informing the store manager of harassment by her supervisor in the meat department. "I was told that maybe I shouldn’t have gone for a ‘man’s job’ if I didn’t like this kind of thing." Krogers bosses cut her hours back and then took her off the schedule. Mireles, family members, and supporters organized a one-day protest outside the store. Mireles joined the United Food and Commercial Workers union to help advance her fight.